Silicon (periodic table symbol: Si14) is a chemical element that can be found in several minerals on Mars. 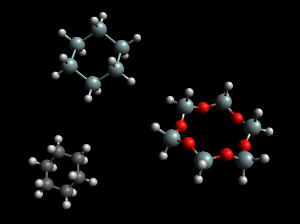 Structure of cyclohexasilane (top), cyclohexasiloxane (bottom right) and the hydrocarbon cyclohexane (bottom left). As a group 14 element, silicon has a chemistry similar to that of tin and lead, and especially that of carbon and germanium. As we go down from carbon at the top of group 14, the reactivity (and electropositivity) of the elements increases. At the same time, the bond enthalpy decreases for chains of the element. That is, C-C bonds are more stable than Si-Si bonds, which are more stable than Ge-Ge bonds, etc. The strength of their bonds with hydrogen similarly decreases. This is why, for example, methane is more stable than silane. Despite the instability of silicon chains relative to their carbon analogues, they are industrially significant. The silanes are acyclic chains of singly-bonded silicon atoms analogous to the alkanes. The cyclosilanes are (highly unstable) cyclic silanes. The silenes are acyclic chains of doubly-bonded silicon atoms, analogous to the alkenes. Due to the instability of Si-Si bonds, longer chains of silicon atoms are often constructed with some other atom between the silicon atoms, which bonds more strongly to them. In the case of the siloxanes, this results in Si-O-Si chains. For comparison, the enthalpy of a Si-O bond is in higher than that of a C-C single bond but lower than that of a C=C double bond, and more than twice that of a Si-Si bond. Silicate, as SIO2 ,is the most common compound found in the martian crust. Other silicates exist as well, in the general SiOx form. Quartz is pure SiO2 in crystalline form. Analysis of Martian soil shows a composition broadly similar to that of Earth, with oxygen and silicon also taking the first and second respective positions. Silicon is the second most common element in the earth's crust (after oxygen); in fact their compound silica makes up about 60% of the crust, as on Mars. Silica can be obtained in-situ directly from the martian regolith. However is is usually mixed with contaminants and will usually require a separation process before it can be used for martian industry. There may have been geological processes that have concentrated silica into easily usable forms. Silicon production is usually a by product of steel production. Silicon is the main material for monocrystalline solar cells, used for solar panels. Silicon it is needed for silicone synthesis to produce synthetic materials. High-purity silicon (produced by deposition from silanes) is used as a semiconductor in electronics (after being suitably doped). There are alternatives, such as germanium, though their exact performance characteristics vary and silicon is the obvious choice due to its abundance. Silicon Carbide, SiC, is used in metallurgy and is an extremely hard ceramic. Silicon is used in the production of iron. How much energy is needed to produce 1 kg of pure silicon for electronics? Very fine particles of silicates may be a cancer causing agent. Dust protection would be an issue in a martian settlement. "How pure does silicon need to be? - Peter"
↑ C.E. Housecroft & A.G. Sharpe - Inorganic chemistry 2012. ISBN 978-0-273-74275-3 pp. 433, 444-446. 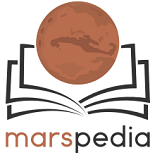 ↑ NASA JPL - Mars Pathfinder: Analysis of Martian Samples by the Alpha Proton X-Ray Spectrometer: Preliminary Results Access 2013-04-28. This page was last edited on 11 April 2019, at 08:55.